Say bye bye to back, neck, knee, shoulder, ankle, and muscle pain. The Just Potent Turmeric Curcumin is a patented all-natural turmeric curcumin, clinically proven to safely deliver 5-6 times more absorption than leading enhanced (95% curcuminoid) turmeric supplements. While other turmeric curcumin supplements focus on “curcuminoids” alone, the Just Potent Turmeric Curcumin, through its patented composition and delivery form, delivers more than just curcuminoids. The Just Potent Turmeric Curcumin delivers at least 45-50% curcuminoids and over 200 beneficial turmeric root nutrients with the highest possible absorption. At the core of our main ingredient is a patented process (non-chemical by the way) in which critical turmeric root nutrients are standardized and blended back together within a natural turmeric matrix. This multi-stage process creates an excellent dual-phase polar/non-polar emulsion that can pass through the lipid membrane. This process gives the Just Potent Turmeric Curcumin an UNPRECENDETED BIOAVAILABLITY / ABSORPTION. 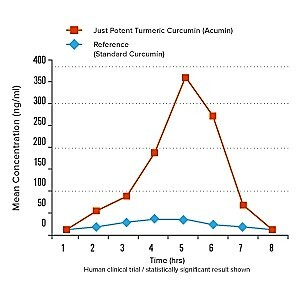 Blood plasma concentration is the gold standard technique for measuring curcumin bioavailability. The Just Potent Turmeric Curcumin when compared to your current curcumin supplement (≤95%), is by far superior in terms of absorption and efficacy. Furthermore, the Just Potent Turmeric Curcumin provides over 200 unmatched turmeric root benefits. ​Your current curcumin supplement most likely works for 10 hours or less with measly and overexaggerated absorption levels. The Just Potent Turmeric Curcumin is the GOLD STANDARD turmeric curcumin consumers have longed for; working round-the-clock with absorption levels never before seen in the industry. ​Backed by numerous double-blind, placebo-controlled human studies, the Just Potent Turmeric Curcumin is the only turmeric curcumin supplement that provides over 200 turmeric root nutrients while at the same time providing unmatched antioxidant levels, anti-aging support, and bone & joint support. For whatever reason(s) you use turmeric curcumin, the Just Potent Turmeric Curcumin is sure to meet and surpass those needs. Turmeric curcumin in its natural state is poorly absorbed by the body. For example, your grocery-store-bought turmeric curcumin may provide some turmeric root benefits, but the benefits derived are very little and insignificant. A highly absorbable turmeric curcumin supplement like the Just Potent Turmeric Curcumin surpasses store-bought curcumin multiple times over in terms of health benefits and absorption levels. ​The Just Potent Turmeric Curcumin achieves it absorption levels through a natural patented process in which critical turmeric root nutrients (turmerone oil, polysaccharides, turmerin protein, dietary fiber) are standardized and blended back together within a natural turmeric matrix. This multi-stage process creates an excellent dual-phase polar/non-polar emulsion that can pass through the lipid membrane. Consumers believe 95% curcuminoids simply means more potency and absorption; that's factually incorrect. 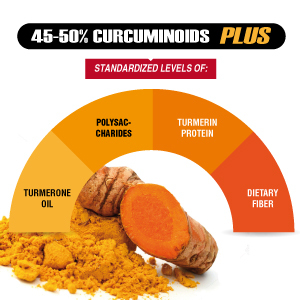 The fact is that the Just Potent Turmeric Curcumin, while providing 45 - 50% curcuminoids, is 6X more superior to 95% curcumin with oil and 5X more superior to 95% curcumin with phospholipids. ​We have formulated the best turmeric curcumin we believe there is. The Just Potent Turmeric Curcumin benefits per capsule (BPC) surpasses the next best thing from the closest competitor many times over. The competition wants you to take 2, 3, 4, 5, or even 6 capsules daily for subpar benefits and below average absorption. We say this: 1 capsule daily of the Just Potent Turmeric Curcumin provides you the highest possible absorption and over 200 confirmed turmeric root benefits. Where is the Just Potent Turmeric Curcumin Manufactured? → ​Manufactured here in the United States. ​How many capsules are there and how long will a bottle last? →​ ​Each bottle contains 90 capsules and is meant to last 90 days. Serving size is just one (1) capsule. ​Are there any side effects associated with taking this supplement? → ​From numerous studies and clinical trials, there appear to be no side effects associated with taking the Just Potent Turmeric Curcumin. If you experience any side effects as a result of using this supplement, discontinue use immediately. ​→​ ​The main ingredient in the Just Potent Turmeric Curcumin is Acumin; a patented form of turmeric curcumin. The other ingredients present in every vegetable capsule are organic curcumin and BioPerine. There are no fillers or additives. All ingredients in the Just Potent Turmeric Curcumin are from natural sources. ​Is this supplement vegan safe? →​ ​Absolutely. This supplement does not contain sugar, salt, dairy, yeast, wheat, gluten, soy, preservatives, artificial colors or flavors. ​What is the shelf life? ​→ Minimum shelf life is 3 years. Potency and efficacy will be good through expiration. ​Can I open the capsule and mix with other foods? ​Where are your ingredients sourced? ​→ ​Like majority of all turmeric curcumin supplements, the ingredient source is India. Each batch of ingredient is thoroughly tested to ensure it conforms to the American standard we have all grown accustomed to. Only when it meets our standards and quality control checks that we are able to start the manufacturing process. ​How long will it take to see results? →​ For some consumers, positive results can be immediate; first day of use. For some, it may take up to two weeks to a month for real results. Be aware that each bottle will last for 3 months when taking 1 capsule daily. ​Can I take more than one capsule? →​ Yes, you can. We are all different in our special ways. If you feel one capsule (recommended serving size) isn’t giving you the needed kick, you may increase to two capsules daily. Are there going to be side effects with higher dosage? →​ No, there are no side effects associated with increasing dosage amount. We have done the necessary tests and studies to be able to make this claim. You’re safe. Why is this more expensive than regular turmeric curcumin? →​ This isn’t a regular turmeric curcumin. The Just Potent Turmeric Curcumin is made from patented curcumin that offers superior absorption than what’s available in the market today. While a bottle of the Just Potent Turmeric Curcumin will last for 90 days, the competition capsule count, while the same, will only last for 30 days. What this means is that you’re paying more when you buy 3 bottles (90 days supply) of your regular 95% curcumin supplement compared to buying just one bottle that will last for 90 days. We have done the math, we provide better quality turmeric curcumin at a more competitive price. Does it smell or have any odor? →​ The Just Potent Turmeric Curcumin has a mild "spicy-herby" aroma. This is not a strong aroma that may prevent you from using this supplement. The aroma testifies to the fact that real ingredients are used to manufacture the Just Potent Turmeric Curcumin; not white powder colored with yellow chemicals. →​ The capsule size is size 0 and these are small, easy to swallow capsules. Are there hidden ingredients not shown on the label? →​ No! At Just Potent, we believe in full transparency. For every product, we have a 100% honesty-backed ingredients and product label. What we say is in our supplements is what you will find in them; no more, no less. 4 ingredients make up the Just Potent Turmeric Curcumin: Acumin (patented form of curcumin), organic curcumin, BioPerine, and vegetable capsules; nothing more, nothing less.